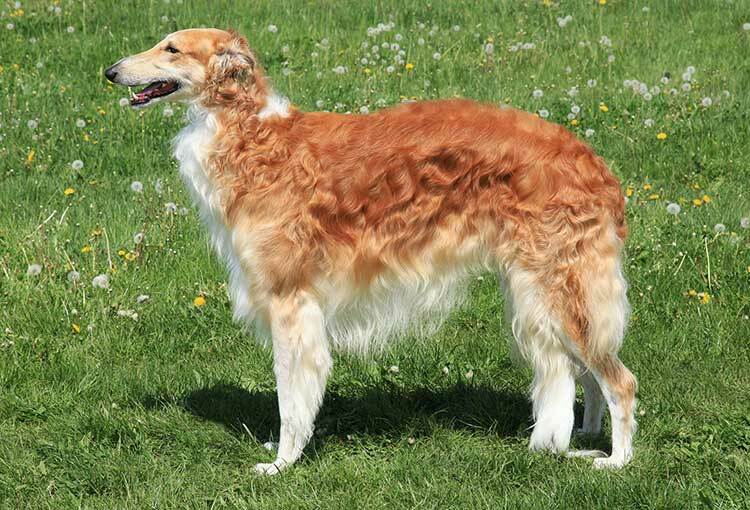 Originating in Russia, where Borzoi is a general term for sight hounds, the breed was used to protect its masters from wolves on the Russian Steppes. With their exceptionally long stride the Borzoi could easily outrun and catch most prey. An elegant and highly distinctive sight hound, hunting with Borzoi was very much a ceremonial affair for the Russian tsars and noblemen. The horses and the hounds were often dressed in highly coloured hunting silks, and the Borzoi were even transported to the hunting field in covered vehicles so they arrived in style. The riders, and even the grooms, were also dressed in elaborate costumes. The hunting technique involved the beaters finding and flushing out a wolf, then setting two perfectly matched Borzoi to chase it. Thanks to their incredible speed, the dogs would catch up with the wolf in an instant, and attack from either side, seizing it and dragging it to the ground. The huntsmen would then catch up and kill the wolf with a ceremonial dagger. When the hunt was over, there would be celebration and feasting — and, of course, the Borzoi were guests of honour. Many still seem to expect the same regal treatment today! The Borzoi can be exceptionally stubborn if it does not feel motivated to perform a task and whilst they can be trained, early socialization to a wide variety of situations will help form a nicely balanced character and temper some of their more independent minded actions. With early socialization the Borzoi should get along quite happily with other animals. The most pressing health concern for the breed is Bloat, although with the correct feeding methods this can be avoided. The breed is generally free of other disorders although poor breeding practices have left some lines with a tendency to Hip Dysplasia and eye problems. Letting them off the lead in wide open spaces may be tempting and they will certainly enjoy it, however the Borzoi will follow any scent or sight that appeals to it.